What would the world be like if MacGuyver never existed? Besides being completely boring, a world without that show could have kept the majority of Americans from ever realizing how important a pocket knife and a rubber band could be. There could also be a lack of inventiveness and perhaps a lack of being able to survive under pressure. Sure, most of the scenarios in good ol' Mac's world are completely unrealistic, but it makes one think that if he could do it with a piece of string and a banana peel, by George, I should be able to replace a bulb or tighten a screw with a Beza Windzone Great Escape Tool Kit. This tool is like your standard utility pocket style tool, except much more. 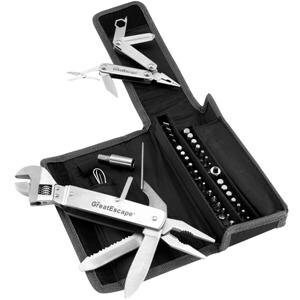 It has SAE and Metric sockets, Hex keys galore, and everything comes in a handy carrying case. It has spring-loaded needle nose pliers on one end and an adjustable wrench on the other. With other handy tools like a large knife blade, screwdrivers, and wood cutting blade, you might just keep one in your car, too. This won't replace all the tools in your garage, but it can help out with a ton of small repairs that might need to get done on the side of the road.